wears out or change colors anytime. When the velcro wears out... Buy new straps, not new boots! RES Bell are quality constructed at affordable prices. Constructed of Ballistic material with superior strength and quality seam stitching. No-turn knob built in, keeps boots from turning. Inner lining wicks moisture. Interchangeable straps make changing your look simple. 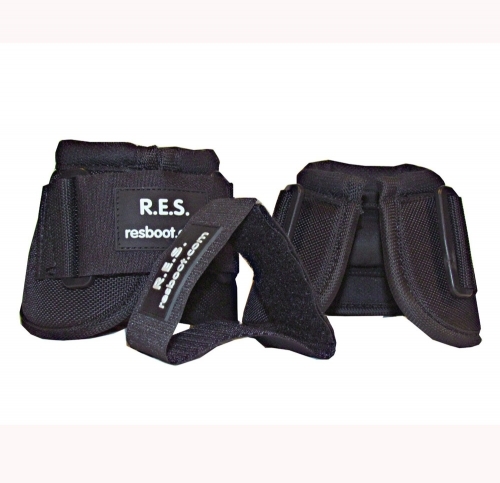 Each set comes with 2 heavy duty velcro straps, in black. Be sure to check out all the HOT NEW replaceable velcro strap colors. (Colored straps sold separately). (Please note that sizes do run a bit small compared to most PVC bell boots, so please order a size up).